Gas sensing has always played an important role in worker safety, but the power and accuracy of new wireless-based solutions is bringing a new level of protection. Sean Ottewell reports. Wireless gas sensing has been available for many years, but as with other wireless solutions it faced concerns about safety and accuracy and the ability to operate in difficult industrial environments. Today those concerns are history and wireless solutions offer unprecedented levels of monitoring speed and accuracy. For example, RAE Systems has introduced what it describes as the first wireless, four-gas pumped and diffusion monitor for real-time industrial, oil and gas and emergency response gas detection. Known as QRAE 3, it is designed to significantly enhance worker safety in industrial environments and better protect first responders. 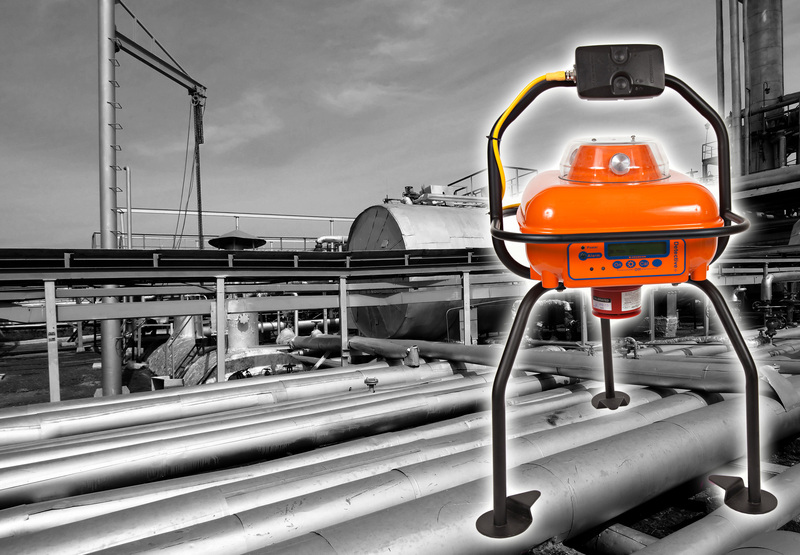 The versatile and rugged, one- to four-sensor gas monitor provides continuous exposure monitoring of oxygen and combustibles, together with toxic gases including hydrogen sulphide, carbon monoxide, sulphur dioxide and hydrogen cyanide. QRAE 3 is certified for use in hazardous environments, and is designed for use across a broad array of industries where exposure to toxic gas is a constant safety threat. When a situation arises, safety officers must make critical, split-second decisions about how and where to deploy resources. They need access to real-time threat data, which QRAE 3 can provide, to help make faster, more informed decisions to protect lives and property, says RAE. QRAE 3's wireless communication capability enables access to real-time, remote instrument readings and alarm status - including an innovative 'man-down' alarm - from any location, for better visibility and faster response. Real-time hazard readings can also be communicated to the ProRAE Guardian safety system and the EchoView host closed-loop wireless system for safety-enhancing wireless monitoring outside the hot zone, from a plant safety office or from a remote, enterprise location. This can help facilitate faster, data-driven decision making to alert responders, save lives and protect assets. "With the addition of the QRAE 3, RAE Systems now offers the most extensive line of area, survey and portable wireless gas detectors making affordable, cutting edge toxic gas detection solutions available to more customers across a broader range of applications," said Thomas Negre, vice president of products and marketing for RAE Systems. - An advanced user interface. QRAE 3 features large graphical display, icon-driven user interface through intuitive, two-button operation. Also new this year, from Crowcon, is the Detective Net wireless module. This allows up to 25 of the company's Detective+ gas detectors to be linked without cables (Fig. 1). It is aimed at the oil, gas, petrochemical and utility industries. The Detective+ is a free-standing, transportable multi-gas monitor that can be used individually or in groups to monitor up to four gases at once. By using the Detective Net module, up to 25 Detective+ units can be linked wirelessly and positioned as much as 100metres apart. Should wireless connection between two of the detectors weaken, the RICOCHET wireless network will 'self-heal' and automatically re-route communications via alternative devices. This creates a mesh-type network, ensuring greater reliability in safety-critical situations. Over a dozen gas sensor options are available with the Detective+, including IR sensors for flammable gas that are immune to the poisoning effects which plague standard flammable gas sensors. If a dangerous gas level is detected, the Detective+ unit warns with a wailing 104 dBA siren and flashing, high intensity LED beacons which are visible from all angles. A signal is also sent to all the other units, alerting workers to the danger. In addition Detective Net transmits other fault information such as loss of signal or low battery power. If the signal is very weak, for example because of thick metal bulkheads, Detective Net can act as a repeater to boost the signal between units. A cable can be used to extend the reach of an individual Detective+ unit and put it in a position with a stronger wireless signal - this is especially useful in cramped, confined spaces. Meanwhile Gastronics, which says it pioneered the first all-in-one wireless gas monitor where the radio is an integral part of the gas monitor, now has the True Wireless gas detection system. This, says the company, offers the most economical solution for monitoring gases from remote locations. Its UHF/VHF monitors offer up to six watts of power and are capable of transmitting in and around steel structures and over long distances in worst case scenario. True Wireless is also available for ISA100.11a mesh networks and M2M GPRS cellular radio. Simtronics, an IST company, has announced that its MultiFlame series DF-TV7-T and DM-TV6-T are the first triple IR flame detectors on the market to be certified up to safety integrity level SIL3. The devices recently underwent stringent functional safety assessments by third party agency LCIE Bureau Verita and were found to be in compliance with IEC 61508:1-7. MultiFlame DF-TV7-T and DM-TV6-T series flame detectors provide fast and accurate detection of hydrocarbon fires while ensuring reliable false alarm immunity. Based on a multi-infrared spectrum (3IR) technology, the detectors provide one of the longest distance-to-detection ranges on the market (260 feet for n-heptane). Simtronics says that the 3IR detectors are also highly sensitive to fire, and ideal for use in dirty environments and for smoky fires. Also available in the MultiFlame product line is the DF-TV7-V, a UV/2IR version certified for use in SIL2 applications. The MultiFlame DF-TV7-V uses combined ultraviolet/IR optical technology that provides immunity to false alarms based on the two IR channel design. Both solutions lead to a very efficient false alarm rejection while keeping optimum sensitivity to fire. All MultiFlame detectors are equipped with a continuous optical lens auto-check to ensure that the optical path is clear and that the detector functions properly. Sensors can be replaced easily in the field without removing any cable glands. In a separate development, fellow IST company Detcon has seen its model X40 NEMA 4X alarm and control system receive cTUVus NRTL certification for non-hazardous locations. The rugged, power-efficient controller, designed to monitor gas detection sensors and a wide range of other field devices, can receive and supervise 4-20mA or RS-485 field device inputs. Safety showers: are yours fit for purpose?